One of the readers of this blog (the only reader of this blog), Dave, asked why do I blog. It has selfish reasons for sure. It’s a mix of sharing experiences, venting, documenting techy journies and business experiences. There’s the human side of it. If you stumble on one of the topics, I’ll always invite you to get in contact. My general apporach in life is that it’s better to be creating things than to be consuming things. This post by Patio11 of the internets was a real motivator: “Do not end the week with nothing”. That’s a call to people in employment or otherwise creating assets for other people. It takes hard work to build up capital, and if you don’t try it won’t happen. On content ownership, it’s still an impressive thing that someone can publish on the open web. DNS, servers, and all that come together to let you publish on what’s basically your own platform. This is different to writing your articles on a social media platform – those are not yours to keep! Seth Godin advised to blog every day. I don’t do that, far from it. Seth is a marketer. But reading his blog actually feels more like him figuring out how to deal with life, and wrapping it up as advice for other people. Stoic, Marcus Aurelius wrote for himself to teach himself, seemingly without the intention of sharing that with others. There’s that balance of writing something that’s useful for me and useful for you, dear potential reader. Some people take the Seth Godin daily publishing route. Sacha Chua uses digital sketches to document her daily thoughts. Then she works to summarize weekly or monthly thoughts, and it’s interesting to follow along. 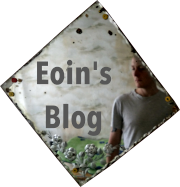 I’ve tended to only blog when a topic has been on my mind enough to have a bit to say about it.